[RSS]: The LEGO Movie 2: The Second Part sets available now! 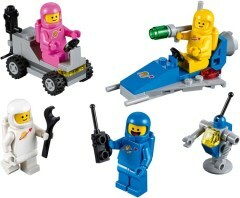 The entire The LEGO Movie 2: The Second Part range has been released today on shop.LEGO.com, including 70827 Ultrakatty & Warrior Lucy, 70830 Sweet Mayhem's Systar Starship and 70841 Benny's Space Squad! Furthermore, a selection of City, Friends and Technic sets are now available in the UK and Europe. These will become available around the world on the 1st of January, along with the Star Wars and NINJAGO sets, among many others. "This month we are offering Brickset readers a preorder offer for the new The LEGO Movie 2: The Second Part Box of 60 Minifigures for only €184.99 when you enter code Brickset50 at checkout (approximately £166.50 / $212) That's a saving of about €54.41 / $27.40 / £12. "Please note, this is a preorder only offer. Minifigures will be shipped late January/early February 2019."